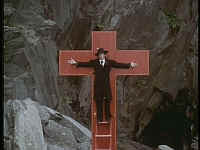 scene from the Ken Russell movie "Mahler"
1. I'm using a coffin to receive the hammer blows of fate. 2. Because Thai musicians are superstitious, it will be a fake coffin. 3. The coffin isn't full-size because the first hammer-blow is said to represent the death of Mahler's daughter. 4. I used social networks to raise the money for the concert, but social networks are not being used to pay for the fake coffin. 5. Alma, the subject of the incredibly passionate love theme, screwed other men, though not (unlike in the movie Mahler) while Mahler was being buried alive in a coffin with a window. 6. The conductor is working on a musical version of "Dok Som Si Thong", which contains no coffins.